This time, I experimented to make an appetizer dish by using hoshigaki. I've been so crazy about hoshigaki from Otow Orchard. As I mentioned in my previous blog post, hoshigaki is great on its own, but I'm also finding versatility of hoshigaki to make combination with other flavors. 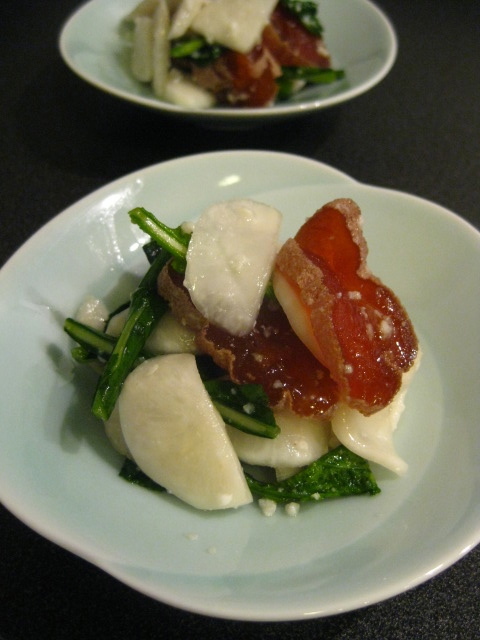 Hoshigaki and Japanese turnip ("kabu" or it's also called "Tokyo turnip") are actually not an unusual combination and they are sometimes tossed together in vinegar sauce. But, I thought that they would be great with shio-koji, so I tried it. Peel and slice 2 small-size kabu into half. Then, cut into thin slices (about 1/8" or 3 mm thick). Cut leaves from 1 kabu into 2" or 5 cm thick. Mix both in 2 teaspoons ship-koji by hand. Put them in a pickle-making container (or just use a bowl and weight) and marinade for 30 minutes. 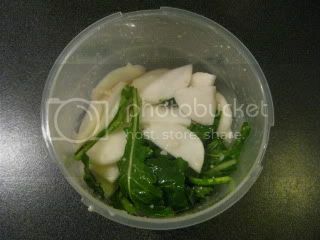 Drain the liquid and gently squeeze the turnip and leaves to drain any excess moisture. Slice 1 hoshigaki into 1/8" or 3 mm thick, and toss with the turnip and leaves. That's it. And the flavor was incredible! Wow, it tasted just so delicious and elegant. The textures of the quick-pickled turnip and chewy hoshigaki worked so nicely together, and the gently saltiness of ship-koji actually amplified the complex flavor of the hoshigaki. It tasted like a first course at a fancy Japanese kappo restaurant. This recipe is a real keeper.